1 Make the brine: In a medium saucepan, combine the water, salt, pepper, thyme, and garlic. Bring to a boil over high heat, stirring to dissolve the salt. Set aside until completely cool. 2 Put the pork chops in a nonreactive container that holds them snugly in a single layer. Add the brine, which should cover them. Cover and refrigerate for 24 hours. 3 About 1 hour before cooking, remove the pork chops from the brine and set them on a wire cooling rack at room temperature to dry. Discard the brine. Prepare a moderate charcoal fire for indirect grilling (page 102) or prehat a gas grill to moderate (375˚F), leaving one burner unlit for indirect grilling. 4 In a small saucepan, combine the butter, bourbon, and honey. Cook over moderately low heat, stirring until the butter melts and the honey dissolves. Keep warm. 5 Pat the pork chops with paper towels to remove any remaining surface moisture. Set the chops directly over the coals or flame and brown both sides, about 3 minutes per side. Then transfer to indirect heat, cover the grill, and cook until the pork chops offer some resistance to the touch but are still springy, not firm, about 4 minutes longer. On an instant-read thermometer, the internal temperature should measure about 150˚F for medium. 6 Once the pork chops have been moved to indirect heat, grill the peaches. Brush them all over with the butter-honey mixture and place cut side down directly over the coals or flame. Cook until the peaches are lightly charred, then turn, baste again, and cook just until they are tender and juicy. The pork chops and peaches should be done at roughly the same time, but if not, move whichever is done first to a cooler area of the grill. 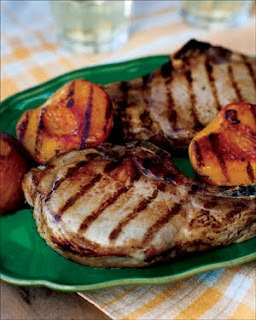 Serve each pork chop alongside half a grilled peach.